When I was a kid I saw both David Lean's "Oliver Twist" and Carol Reed's "Oliver!," and then promptly spent a summer plowing my way through Dickens' book, which I hadn't read, hoping to step into the fantasy launched by those films. After that, any story involving orphans held a huge appeal, and if it also took place in Victorian-era England, well, even better. It was a fantasy that lasted for years. "The Boxtrolls," the latest film from the Oregon-based stop-motion studio LAIKA (who brought us "Coraline" and "ParaNorman"), reminded me of getting lost in those vividly told and sometimes awful stories of children going up against a cruel adult universe. "The Boxtrolls," co-directed by Graham Annable and Anthony Stacchi, has a darkness to it—in the images and in its themes—a darkness that is practically existential in nature. It's potentially heavy stuff for children, but children have been thrilling to "heavy stuff" since stories for children were invented. What "The Boxtrolls" does is create an entire hierarchical world, with strict rules governing that structure, and it introduces us to a cast of eccentric and often grotesque characters who live and breathe in that fetid air. It's gloriously inventive, wonderfully funny, and gorgeous to look at, the screen filled with sometimes overwhelming detail. 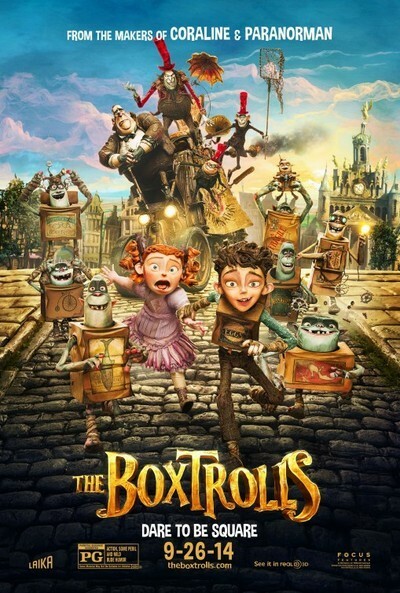 The universe "The Boxtrolls" gives us is one both strange and familiar: a town that exists in some kind of collective unconscious with its narrow streets, massive main square, teetering mansions and slimy alleyways. It's out of a fairy tale; it's medieval Europe; it's Dickens or the films of Jean-Pierre Jeunet. Based loosely on "Here Be Monsters," the 2005 novel by Alan Snow, "The Boxtrolls" takes place in a city called Cheesebridge, perched precariously on the slopes of a dagger-shaped mountain. The town worships cheese. Cheese is the equivalent to owning a fully-loaded sports car. If you can afford to have tasting parties where you bring out the latest Brie, you know you have made it. Lord Portley-Rind (Jared Harris) is the Mayor of Cheesebridge, and owner of a "white hat" (the symbol of being an aristocrat). He has a small red-haired daughter named Winnie (Elle Fanning). The fearful silly people of Cheesebridge have been led to believe, through rumor and scary bedtime stories, that the Boxtrolls, little creatures who come out at night and pick through the trash, are going to terrorize the town, steal their children, and eat them. It is Cheesebridge's version of The Bogeyman. At night, the "Snatchers", led by the snaggletoothed and bulbous-bellied Archibald Snatcher (Ben Kingsley), come out, trolling the streets looking for Boxtrolls. The goal is to exterminate the entire Boxtroll population. Archibald Snatcher is unscrupulous, and all he wants in life is to give up his "red hat" (lower-status) and join the "white hats." That selfish motivation makes him do terrible terrible things. He is accompanied by a gruesome trio of helpers: Mr. Gristle (Tracy Morgan), Mr. Pickles (Richard Ayoade) and Mr. Trout (Nick Frost). Mr. Gristle cackles with sociopathic glee at the thought of exterminating the Boxtrolls and is so emotionally blunted he can only repeat the last word of whatever was said to him. Mr. Pickles and Mr. Trout, however, are in the midst of an ongoing crisis of conscience. At first, they believe they are on the side of law and order, they are the "good guys." Increasingly, though, they're not so sure, and they try to reassure one another with unconvincing supportive statements. Meanwhile, we meet the Boxtrolls. The Boxtroll lair is a beautifully-imagined space: a gigantic cave, crammed full of found objects, gears, lightbulbs and toasters; things thrown away by the Cheesebridge residents. The Boxtrolls speak, but we don't understand their language, and there are no subtitles. The Boxtrolls exist as beautiful evidence of the sheer power and clarity of pantomime. They babble and gurgle to one another, and we understand every word. Among the Boxtrolls is a little boy named Eggs (Isaac Hempstead Wright), named so because that's the word on the box he wears like a bulky sweater. Eggs' Boxtroll mentor is a kindly, worried little creature named Fish (Dee Bradley Baker), who looks suspiciously like Abe Vigoda (a connection with his Boxtroll name?) The two play music together. They are friends. Eggs has always lived with the Boxtrolls, and thinks he is a Boxtroll. LAIKA has outdone itself in its imagining of this complex world. There's a ballroom dance in Lord Portley-Rind's mansion that has to be seen to be believed. At times, we see it from Winnie's perspective, the big swooping skirts at her eye level whooshing by her, and other times, the camera circles up to look down on the twirling colorful couples. The streets of Cheesebridge are steep and twisting, with lonely streetlights struggling to emanate their light through the blue gloom. There is a gigantic bouncing cheese wheel, catapulting itself down the slopes like some engine of doom and destruction, both hilarious and scary. After a night of scavenging, the Boxtrolls stack themselves into a sleeping formation, and, overhead, the bare lightbulbs they have hung from the dirt ceiling turn their lair into a place of wonder and magic. These images have great emotional resonance. The details of the costumes are amazing, the frayed stitching on Snatcher's waistcoat, the tiered ruffles of Winnie's pink dress, the gleaming ridiculous badges sewn onto the front of Portley-Rind's coat. The images do not have a modern gleam, they are not slick. They feel slightly tattered, hand-made, deteriorating. Without being didactic, "The Boxtrolls" presents the dangers of a hierarchical society, separated out into high-status and low, and also has some very interesting and moving things to say about identity, family, and morality. There is a suggestion that a moral compass exists on its own, whether it has been nurtured in us or not. Critical thinking skills means you look around and evaluate reality based on the evidence right in front of you. The residents of Cheesebridge, drowning in myth, rumor, and the comfort of intermittent mob violence against the Boxtrolls, are unable to do that. But Winnie slowly realizes she has been lied to her whole life. She is able to evaluate her world and see that the way things are set up is wrong and unfair. "The Boxtrolls" is a beautiful example of the potential in LAIKA's stop-motion approach, and the images onscreen are tactile and layered. But, as always, it's the story that really matters, and the story told here is funny, ugly, poignant and true.